Who knew? Banana flour. I never imagined this unusual flour would be one of my favorite for baking. Why? Banana flour is kind of magic. I’m not kidding. It’s pretty much magic. Banana flour was brought to the United States for the first time last year by a company called WEDO Banana Flour. Like us, they did a successful Kickstarter campaign to bring the flour to market. Originally produced in Kenya, this flour made of dehydrated green bananas is now produced in South America and brought to the United States. Why would anyone do this? It turns out that green bananas, because they are not sweet at all, are high in starches. (And that includes resistant starch, a category of foods we’re just starting to understand are good for the gut.) Banana flour doesn’t really taste like bananas. There’s maybe a tiny hint of them. Instead, the flour has a slight earthiness to it, like wheat bran. And it actually acts like wheat in some cases. I’m seeing some remarkable baked goods come out of our oven when we add a small percentage of banana flour to our All-Purpose Flour or our Grain-Free Flour Blend. Sometimes, we use more. Last week, we made the buckwheat pancakes recipe from Joy of Cooking, using raw buckwheat flour instead of the toasted stuff that is the norm. And we used 1/2 cup of the banana flour instead of the 1 cup of wheat AP flour in the recipe. A little coconut sugar, some buttermilk, and some butter we browned. There’s a warm, nutty taste to buckwheat, brown butter, and banana flour we thought might play well together. So we’re happy to announce that WEDO Banana Flour is the latest sponsor of this site. We’re truly excited about introducing this food to you. We’ll let David Wintzer, one of the co-founders of WEDO Banana Flour, tell you more. What compelled you to import banana flour to the US? Co-creator David Wintzer was working with a group of Kenyan women distributing micro-loans through a non-profit. One of the women David was working with had a small factory that made banana flour, flour made from unripe green bananas. It was green bananas peeled, sliced, dehydrated and milled into flour. In an effort to help these women David came home and approached high school friend Todd Francis with the idea, after having the product tested and knowing it was gluten-free, the idea was born to bring banana flour back to the US and create a viable business, WEDO banana flour. Why is it important to you that it’s gluten-free? Not knowing much about gluten when the idea of this business was sparked reading about the effects David told his mother whom had suffered from chronic head aches for 20+ years. Once telling his mom about migraines being a side effect of gluten intolerance David’s mom went GF. Five years later, she’s migraine free. As things developed, David discovered his step-daughter had a family history of gluten intolerance and sure enough, gluten was affecting her well being. David, Todd and their families have fully adopted a gluten free lifestyle. What are the most interesting qualities of the banana flour? 1. Since we use unripe green bananas the sugar content hasn’t fully developed so the product doesn’t taste like bananas. It has an earthy, wholewheat like flavor. It mimics “gluten-like” products remarkably well in taste and texture which allows for it to be a versatile product. Because of the high starch content you can do almost anything with this flour, you can batter, thicken soups and gravies, boost morning smoothie and bake almost anything, all of this without altering the flavor of your creations. 2. Banana flour has a property in it called resistant starch (RS2) which is a pre-biotic which aids digestion by passing the small intestine and going straight to the large intestine. It “resist” digestion and feeds the good bacteria in the gut. However, RS has to be eaten in it’s raw form, once you cook RS above 140 degrees F. you lose the majority or the RS. Can you tell us a story of a customer who has loved the flour? I have pasted a (long) testimonial from one of our customers. Some of our best success stories come from those who are diabetic, have digestion problems and can’t process grains. The problem/solution goes beyond gluten, it’s rooted to ulcers, diabetes, autism and much much more. “We have two kids who have autoimmune problems galore, and it has stressed my health on top of my own medical problems. We have been off GMOs, pharma, and anything else possibly damaging, and our entire family (5 kids, myself and hubby) for about 5 years now, and we have ALL benefitted. This product of yours is HIGHLY influencing our health. I am so sick and due to being severely sick, I also am highly sensitive which is not a bad thing – I can tell what bothers me almost immediately. And, I can also tell what makes me feel better. When I take your product, my body . . . . just feels good. One of my sons says he feels the same way with your product and he loves the green banana flour, as he is in college and can blend it as a smoothie and take every day or so. It is key for feeding our good gut bacteria and defending our bodies. Thank you, David and Todd, for bringing banana flour to the United States. 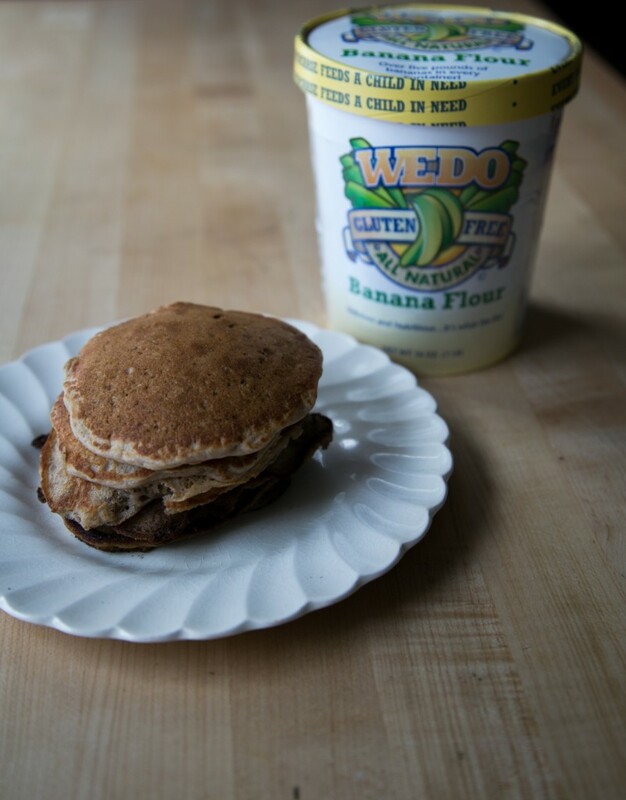 The folks at WEDO Banana Flour would like to offer a package of banana flour to three of our readers. Leave a comment here about why you might be interested in this to be eligible for the giveaway. Winners will be chosen at random on Friday, February 27th, then notified by email. Brown the butter. Set a small pot over low heat. Add the butter. Let the butter melt, then come to a simmer. Keep an eye on the butter as you keep heating it, letting the edges come to a boil. There might be some spattering as the water in the butter starts to evaporate. Raise the heat to medium and give the pot a swirl to prevent any places from burning. After about 5 minutes, the butter will start foaming on the top and release a nutty smell. You’ll see parts of the butter at the bottom of the pan start to brown. Watch the pot carefully, swirling it sometimes. Watch the butterfat solids on the bottom of the pot and let them get as brown as you wish. Be careful — it’s so easy to burn butter. Take the pot off the heat immediately and set it aside in a cooler place. When the butter has cooled, pour it into a small bowl. Beat the egg whites. Crack the eggs. Separate the yolks and the whites. Set aside the yolks in a small bowl. With a whisk, or better yet in the bowl of a stand mixer, beat the eggs to stiff peaks, which takes about 3 to 5 minutes. Turn off the mixer and let the egg whites sit for a moment. Combine the dry ingredients. Whisk together the buckwheat flour, banana flour, coconut sugar, baking soda, and salt in a large bowl. Make the batter. Whisk together the buttermilk, egg yolks, and cooled brown butter. Make a well in the center of the dry ingredients. Pour the wet ingredients into the dry ingredients. Using a rubber spatula, stir them together gently until there are no more dry patches of flour visible. Fold in the egg whites, gently. The batter will be a little thicker than traditional pancake batter. If you put a spoon into the batter, then lift it high in the air, you’ll watch the batter trail downward from the spoon slowly. This will make a good pancake. However, if you like thinner pancakes, add more buttermilk. Cook the pancakes. You know how to make pancakes, right? Low heat. 1/4 cup of batter per pancake. Nonstick griddle or a little butter or coconut oil in a skillet on the stove. The first batch is always a little wonky. Keep adjusting the heat as the griddle or skillet grow hotter. This should make you quite a few batches of great pancakes. Makes about 1 1/2 dozen pancakes. Banana flour?! Sounds so good- especially how you described the earthy flavor. Will have to have a Google. I’ve never heard of this before. I’d like to try and play with it! Sounds so interesting and would love to try it. I would love to try this product. Where can it be purchased? oh so cool!!! I remember seeing this kickstarter after it was funded. I’d love to try banana flour! As a fan of all things banana, I can’t wait to try banana flour! Your pancake recipe here looks especially good. i love trying new GF flours, and would love to make those pancakes! I love to bake and have been playing with lots of GF flours lately. I would love to add banana flour to my collection. NOM NOM NOM, as my daughter says. Where can we buy this? This banana flour sounds quite interesting and nutritious. It would be something interesting to add to the pantry for our gluten free family. I have always enjoyed “tostones” fried plantain. which I am assuming would have a taste similar to the green banana flour…i.e. not sweet or banana-like. I would love to have the chance to try this flour. I’d love to try some as I’m really interested in limiting grains as much as possible for my health. Does this have some of the same properties as cassava flour? Thanks, Shauna and Danny for bringing this new flour to our attention! I have seen banana flour in my local market but wasn’t brave enough to try it. Now I really want to get some and experiment with it! I would love to try this product, but unless the Feb. 20 announcement of who the flour will go to was a typo, none of the commenters will be selected as this blog posting came to us on Feb. 21-22, according to comment dates. Anyway, I am intrigued by the product description. Always trying new flours in my flour mix! I had this post in draft for an earlier publication date and forgot to change the date to the 27th. Thanks for pointing it out. It has been corrected now. Another flour to add to my cupboard full! Sounds wonderful and I love to bake with new ingredients. I am always looking for a way to improve the flavor and texture of baking guten free. For the family members who don’t need to eat gluten free and don’t care for the taste of said products it appears that banana Flour would be a great addition to my pantry. Recommendations from Shauna have always been spot on. What I love best about this idea is that the flour is produced by people who really need a way to make a living. Well, the idea of banana flour also appeals to me because I DO love me my bananas!! I hope that the small company keeps going as is, and doesn’t allow itself to get purchased by a large corporation which doesn’t care about consumers or producers. This stuff sounds like a win win for everyone! I got this post as I sat down to eat my made from scratch, first time trying this new recipe I had come up with, gf pancakes. Will love working banana flour into it! This sounds fabulous and I’d love to try it! I’d like to be able to make your pancake recipe with the banana flour. This sounds exactly what I am looking for! I am beginning a Paleo diet and wondering how to replace the grains and grain flour in my diet. Thanks for letting us know about this new and exciting product. I have been gluten-free for 5 months and I feel so much better. I have lost 25 pounds and my arthritis is so much better. People say I glow and look so healthy. I would love to try banana flour and I will keep an eye out for it so I can try it. I make quick breads because i can’t eat yeast. Also drink a protein drink every morning. Sounds heavenly. I would love to give banana flour a whirl in the grain-free, gluten free flour you have made.. maybe even see how it performs in sourdough bread! I am excited for GFG’s blends to hit the shelves, and maybe I can purchase a starter too! As for this banana flour, yes please! This sounds like something with which to get creative! I’m 7 months pregnant with twins and sat up very fast when I saw this come up in my feed. While I haven’t had too many food aversions, my husband does have gluten intolerance – in the time I have before they arrive, I would love to experiment with this flour in all kinds of dishes! I think this would be so fun to play with. Thanks, Shauna and Danny, for introducing it to us all! I’m in! Fingers crossed I’ll be making those pancakes soon! Thanks for the chance to win some banana flour. Wow! I need to order this now! Can’t wait to experiment. My father is diabetic and I would love to experiment with this for him! I’ve done a lot of reading on resistance starch so this product is intriguing. Adding green banana flour to a smoothie sounds like a great way to include said starch. My wife has a long list of allergies that can make baking even gluten-free products difficult. and baking is one of her favorite things to do! We would love to try this flour, in the hopes that it might bring new possibilities back to our kitchen! Oh I can’t wait to try this new GF FLour! I was baking gluten breads for my town when I was diagnosed with celiac disease. I had to stop baking, get well and purge all my equipment. It took six years for me to stop pouting, retool and try baking again. It is all different but intriguing. I would like to try this flour and see if it is a better fit than coconut flour which does not work with my guts. Thanks for the news of this new flour. Yummy! I work for a health food store and we need to sell this! I would love to try this! I’ve gone GF gradually over the past three years (it really has taken me that long– I’m a slow learner and have to experience the pain for myself before it really settles in that this is how I need to live). I am just starting to come out of the “pout and vow never to bake again” stage of grief and need to re-learn how bake in a safe and gut-healthy manner! Awesome that you’d teamed up with WEDO. They’re acquaintances of mine and such great guys to boot. Love that you’re helping them get the word out and sharing the banana flour love. These pancakes look divine, btw! I am always looking to try something new, especially when it is healthy. Prebiotics? Sign me up. I am looking forward to baking with this flour! I love the idea of trying banana flour. I’d never heard of it before, but now I’m intrigued. I’d like to try the pancake recipe and also experiment with baking muffins and maybe a fruit crisp. This sounds great! GF and banana. Mmmm. I would love to try this, especially if it aids in having a healthy gut. I’d love to know more. I would love to win this just to try something new as far as flours in my recipes. Thanks for the giveaway!! Who knew? I can’t wait to incorporate this into our repertoire. Would love to try this! I am new to experiment ing with GF flours, I have avoided baking and waffles and pancakes…miss them terribly! I’d love to try banana flour! I would love to win some banana flour! My son has a type of food allergies called FPIES, which has him on a very restricted diet. He has bananas as a safe food. He is 17 months old and baking him treats with a limited number of safe foods has proven difficult. This sounds very cool. I love adding new flours to my baking list. Going GF 2 years ago is the best thing I could have done to improve my baking skills! I would love to try banana flour. Intriguing–I have virtually stopped baking since going GF two years ago. Would love to give this a try. Also, the packaging sounds very smart. I would love to try this – sounds delicious! With food allergies, celiac, and a failing gall bladder, the lists of foods I can eat is actually easier than the list of ones I cannot. Would love to try banana flour, but would have to figure out how to make that pancake recipe dairy free. Sounds yummy! I spent a semester in Samoa, during which time I ate *a lot* of boiled green bananas. I agree, only the tiniest trace of banana flavor. We are a family with great need for pre-biotics and pro-biotics. I would love the chance to try out this new source. I am fairly new to GF eating. We realized last year that my youngest daughter is better off on a GF diet, and now the whole family is GF, for various reasons. I would love to try this flour. Hoping it becomes widely available. i bake for my GF husband and love trying new flours! I’ve gone GF for about 2 years, but still sometimes have gut issues. I would love to give this flour a try! Thanks so much for the info. I’ll have to find out where to buy it. I’m riddled with autoimmune diseases, type 1 diabetes,collagenous colitis,reactive arthritis,hypothyroidism, to name a few. I’ve recently started a gf diet. The banana flour sounds like a wonderful addition to smoothies and for thickening soup! Can’t wait to try it! How fascinating! I am grain free and am eager to try this banana flour! The thought of making banana bread with banana flour is way too tempting to resist… plus it’s my birthday this week… banana flour birthday cake anyone? Our gluten free home could use some banana flour. Would love to try it in some recipes. Ohhh! We need to try this! My daughter has fpies and has limited safe foods she can eat. She can’t have any grains at all, so we use almond flour as an replacer now but bananas are a safe food for her, so this might mix it up a little for her! This sounds delicious. Curious about the ‘probiotic’ aspect. Would love to play with new baking ingredient to help us through our wicked winter. Look forward to trying it. Thank you for highlighting yet another non-monsanto product to add to our GF repertoire! Would love to give it a try – cheers! Wow — this sounds so good and intriguing. My 15 yr old daughter has been going through a lot of health challenges (which led me to learn GF baking, which ultimately led me to this site. 🙂 ). After trying all kinds of changes and supplements on our own, we have finally started working with a professional to get her healthy. She is very limited in the food she can eat at this stage of the journey — would love to try this flour as a way to bring some more health back into her life! Wow, Shauna, another fun and healthy new food to try. Thanks. Look forward to trying it. Oooh, I’ve never tried banana flour before! I’ve been paleo-ish for the last two years and while I don’t bake that much any more (mostly for coworkers or special occasions), I do still have gluten-free and grain-free “flours” in my pantry when the craving for pancakes strikes. I’d love to try banana flour as another grain-free alternative. our home is 100% GF so that my wife stays healthy. We love to experiment with GF flours – banana, peanut butter, chocolate chip bread is one of our faves. We share super tasty results with our friends who eat gluten free too. We must try banana flour!! My family’s been gluten free for a few months now and I’d love to try this! would love to try this! i am particularly intrigued by the statement that it mimics gluten more closely than other flours. i have found that most flourless baked goods are too dense for my liking. I have never seen or heard of this product! Would love to play around with it. Sounds very intriguing! Wow, this looks neat! I’ve recently cut out most grains so I am, again, clueless at baking (after finally overcoming the gluten free learning curve!). My body doesn’t get along with most grain free flours, so I would love to try out this banana flour! I’m curious. I don’t do any flour, gluten free or not. Interesting product that I’d like to test for myself. Would like to read the label info for sugar, carbs etc. I’m a year into a gluten and wheat intolerance diagnosis and have just about worked out what foods I can and cannot manage. However before all of this I was an avid baker, post wheat and gluten avoidance – my baking is suffering. I would love to try this new and wonderful sounding flour! It’s nice to know people are still introducing new ideas and ways to make us eat and gorge like everyone else while being healthy too! It sounds marvelous! A starch from a fruit source for gluten-free baking! I would like to try it. This sounds like an interesting addition to our GF arsenal. Very cool! I’d love to try this flour. I haven’t had any flour for the last two years since I gave up sugar. I miss baking!! Ooh my mind is spinning with ideas of how I can use this banana flour! Thanks Shauna for this post! ooooooo, cool. Want to try this! Banana bread with banana flour? I’d love to try this for baking! Thanks for sponsoring the giveaway! Very interesting. Looks like a good tool to keep my little boy’s blood sugar from dipping. A tool for celiac and type 1 diabetes? Awesome. Never heard of this, would be interesting to check it out for my son and I.